Background and objectives Thrombospondin type-I domain–containing 7A (THSD7A) was recently identified as the target antigen in about 10% of patients with M-type phospholipase A2 receptor (PLA2R)–negative membranous nephropathy in European and North American populations. The prevalence of THSD7A in other populations and their clinical associations deserve further clarification. Design, setting, participants, & measurements Immunofluorescence assay was performed to investigate anti-THSD7A antibodies in 578 consecutive patients with biopsy-proven idiopathic membranous nephropathy, 114 patients with secondary membranous nephropathy, 64 disease controls, and 20 healthy controls. Glomerular expression of THSD7A antigen was examined by immunohistochemistry. Anti-PLA2R antibodies and glomerular PLA2R expression were also screened. Results Among the 578 patients with idiopathic membranous nephropathy, 12 (2%) patients were identified as THSD7A-positive: ten patients were THSD7A-positive alone, which accounted for 16% (ten of 64) of PLA2R-negative patients; two patients were dual-positive for both anti-THSD7A and anti-PLA2R antibodies and showed enhanced expression of both antigens colocalized in glomeruli. Among the 114 patients with secondary membranous nephropathy, one among 44 (2%) patients with cancer had anti-THSD7A antibodies, whereas 18 of 44 (41%) had anti-PLA2R antibodies. No anti-THSD7A antibody was detected in other disease controls or healthy individuals. Clinical features were comparable between the patients with and without THSD7A. During follow-up, two patients who achieved remission had a clearance of circulating antibodies against THSD7A, whereas antibodies increased in parallel with proteinuria in a patient with a relapse. Conclusions THSD7A-associated membranous nephropathy has a low prevalence in Chinese patients. The double-positive patients suggest dual autoimmune responses. Idiopathic membranous nephropathy, a common cause of nephrotic syndrome in adults, is an organ-specific autoimmune glomerular disease characterized by subepithelial immune deposits (1,2). M-type phospholipase A2 receptor (PLA2R) is the major autoantigen; this receptor protein is expressed in normal human podocytes and is colocalized with IgG4 in the subepithelial immune deposits (2). Approximately 70% of patients with idiopathic membranous nephropathy have circulating autoantibodies directed against PLA2R (3), which have been quickly and widely utilized as a biomarker in clinical practice for diagnosis, treatment, and prognosis evaluation (4–7). Thrombospondin type-I domain–containing 7A (THSD7A) was identified as another podocyte autoantigen in 8%–14% of the patients with idiopathic membranous nephropathy who were seronegative for anti-PLA2R antibody (2.5%–5% of all) (4). It has similar structure and biochemical properties to PLA2R. The pathogenicity of anti-THSD7A antibodies was recently demonstrated in both animal experiments and in vitro studies (5). As is the case for PLA2R (6), detection of the THSD7A antigen in immune deposits was found to be more sensitive than that of circulating anti-THSD7A antibodies (7,8). The presence of THSD7A deposits in glomeruli was more prevalent in a Japanese cohort, being observed in 19.2% of PLA2R-negative and 9.1% of all patients with idiopathic membranous nephropathy (9), than in a Chinese cohort, where the corresponding figures were 7.5% and 0.7%, respectively (10). Only two patients with double positivity for PLA2R and THSD7A antigens have been reported so far (11). Circulating anti-THSD7A antibodies were recently screened by using indirect immunofluorescence test in three different cohorts, which comprised 1276 patients from Germany and the United States. It was shown that the prevalence of THSD7A-associated idiopathic membranous nephropathy was 2.6%. These patients showed high percentages of malignant diseases and possible mechanistic association (8). As yet, there has been no large-scale study (>200 patients) screening circulating anti-THSD7A antibodies in patients from other ethnicities. In this study, we screened the circulating antibodies against THSD7A and PLA2R in a large cohort of 578 consecutive patients with idiopathic membranous nephropathy from China, aiming to identify the prevalence of anti-THSD7A antibodies in the Chinese population. We also detected the presence of THSD7A antigen in glomeruli of all patients negative for anti-PLA2R antibodies. As shown in Figure 1, a total of 578 consecutive patients with biopsy-proven idiopathic membranous nephropathy were enrolled in this study from 2008 to 2016, with a median follow-up time of 35 (interquartile range, 23–53) months. Forty-nine patients with active (viral replication) hepatitis B virus infection, 44 consecutive patients with tumor-associated membranous nephropathy, 21 patients with lupus nephritis class V, 20 patients with minimal change disease, 20 patients with focal segmental glomerular sclerosis, and 24 patients with IgA nephropathy, as well as 20 healthy individuals, were also enrolled in the same time period. Plasma samples were collected on the day of kidney biopsy, and stored in aliquots at −80°C until use. The research was in compliance with the Declaration of Helsinki and approved by the ethics committee of Peking University First Hospital. Informed consent was obtained for sampling tissue and blood. Flow chart of the patients enrolled in the study. Abs, antibodies. The use of steroids and immunosuppressive agents, and the definitions of remission and relapse, were in compliance with the 2012 Kidney Disease: Improving Global Outcomes guideline for GN (10). The primary endpoint of kidney outcome was ESRD; the secondary endpoint was kidney dysfunction, defined as a decrease of >30% of the initial eGFR and below 60ml/min per 1.73 m2. Circulating anti-THSD7A total IgG was detected by indirect immunofluorescence assay kit (EUROIMMUN AG, Lübeck, Germany) following the standard instructions (8). Patients’ plasma was diluted 1:10 and incubated on the reaction fields of slides at room temperature for 30 minutes. After washing, the slides were incubated with FITC-conjugated secondary antibodies at room temperature for 30 minutes. Then the slides were examined by fluorescence microscopy (Carl Zeiss AG, Germany). Positive samples were further diluted to 1:10, 1:100, and 1:1000. Antibody titers were estimated by the fluorescence intensity at each dilution according to the assay instructions (EUROIMMUN AG). Circulating anti-THSD7A antibodies were confirmed by western blot analysis. THSD7A protein in cell lysates from transfected cells (3.7 g/L, a gift from EUROIMMUN AG) was electrophoresed in 6% SDS polyacrylamide gel at 100 V under nonreducing conditions. Then the proteins were transferred to a nitrocellulose paper (Schleicher and Schuell, Dassel, Germany) and blocked in tris-buffered saline with 0.1% Tween and 50 g/L milk buffer for 60 minutes at room temperature and cut into strips. The strips were incubated with plasma diluted 1:100 at 4°C overnight and then with horseradish peroxidase–conjugated anti–human IgG (Invitrogen, CA) 1:20,000 for 1 hour at room temperature. The binding was detected by Image Quant LAS 4000 mini Chemiluminescence imaging system (GE healthcare, Sweden). The immunohistochemistry procedure was performed as previously described (11). Briefly, 3-μm paraffin-embedded sections of formalin-fixed kidney tissue were utilized. After deparaffinating and hydrating, antigen retrieval was achieved by boiling in citrate buffer pH 6.1 with 0.1% Triton X-100 (20 minutes by microwave thermal treatment). Nonspecific binding was blocked with 1% BSA in PBS. Rabbit polyclonal anti-THSD7A antibodies (Sigma-Aldrich, St. Louis) at a dilution of 1:100 were added as the primary antibody at 4°C overnight. The detection system was DakoEnVision HRP (Dako A/S, Copenhagen, Denmark). Circulating anti-PLA2R total IgG was detected using a commercial indirect immunofluorescence assay (FA1254–1005–50; EUROIMMUN AG) (12). Antibody positivity was defined as positive staining at a dilution of 1:10. Anti-PLA2R antibodies were confirmed by western blot analysis as described above, using the purified (>90%) recombinant PLA2R protein (13) (a gift from EUROIMMUN AG). Anti-PLA2R IgG subclass distribution was detected by ELISA using recombinant PLA2R diluted at 2 μg/ml as solid-phase antigen. Plasma was diluted 1:100. Mouse monoclonal antibodies to human IgG1, IgG2, IgG3, and IgG4 (clone no. 4E3, HP6014, HP6050, and HP6025; Southern Biotech, Birmingham, AL) diluted 1:500 were used as primary antibodies. The PLA2R staining procedure was performed exactly as previously described (14). 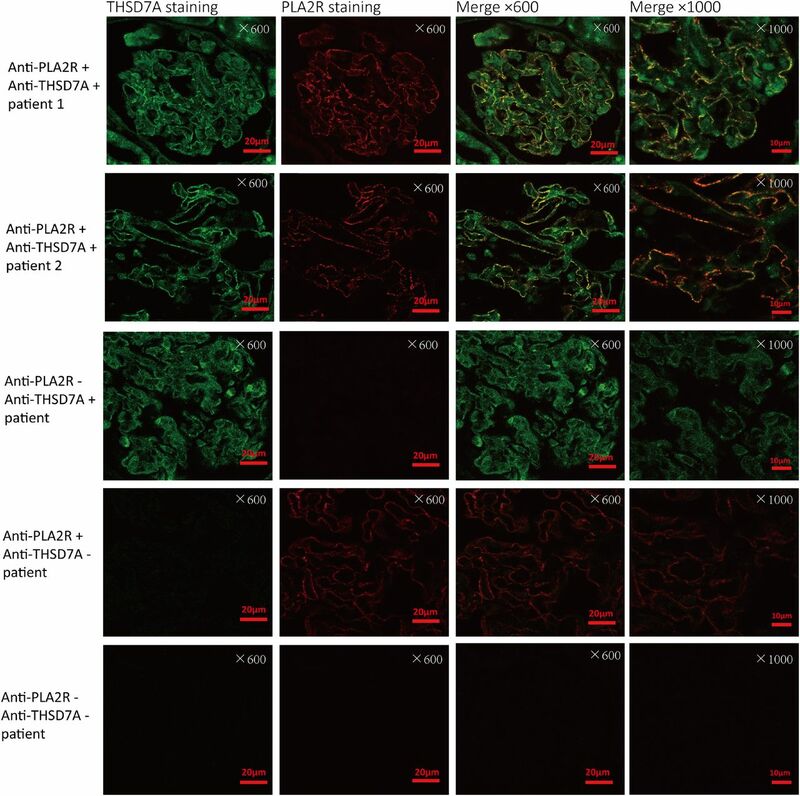 Three-micrometer paraffin-embedded sections of formalin-fixed kidney tissues from the patients with dual positivity for anti-PLA2R and anti-THSD7A antibodies were used. After antigen retrieval, rabbit polyclonal anti-THSD7A antibodies diluted 1:100 and mouse monoclonal anti-PLA2R1 antibodies (Sigma-Aldrich) diluted 1:500 were mixed as primary antibodies and added overnight at 4°C. Goat anti–rabbit IgG (Alexa Fluor 488; Invitrogen) and goat anti–mouse IgG (Alexa Fluor 594; Invitrogen), both at a dilution of 1:400, were used as secondary antibodies. The colocalization of THSD7A and PLA2R in glomeruli was observed under confocal microscope (Zeiss AG, Germany) using a 600 oil immersion lens. Crossreaction between antibodies against THSD7A and PLA2R was detected using antigen inhibition ELISA and immunofluorescence assay. In ELISA, recombinant PLA2R was coated at 2 μg/ml. Plasma diluted 1:100 was preincubated with either recombinant PLA2R or THSD7A cell lysis buffer at concentrations from 0 to 100 μg/ml at 37°C for 60 minutes. Then the mixtures were incubated on PLA2R-coated plates at 37°C for 60 minutes and the bound antibodies were detected. In immunofluorescence competitive assay, plasma diluted 1:10 was preincubated with either recombinant PLA2R or THSD7A cell lysis buffer at concentrations from 0 to 100 μg/ml at 37°C for 60 minutes. Then the mixtures were incubated on immunofluorescence assay mosaic slide at room temperature for 30 minutes and the bound antibodies were detected. Statistical analysis was performed using statistical software SPSS 13.0 (SPSS Inc., Chicago, IL). Parametric data were presented as means±SD. Nonparametric data were presented as median values with their intervals from the 25th to 75th percentile. Intergroup differences with respect to quantitative parameters were assessed using t test for normally distributed data. Differences of semiquantitative data were tested with the Kruskal–Wallis test and the Mann–Whitney U test. Differences of qualitative data were compared using the chi-squared test/Fisher exact test. All probabilities were two tailed, and the level of significance was set at 0.05. Circulating antibodies were screened in all patients. Staining of PLA2R and THSD7A antigens in immune deposits was performed in double-negative patients with idiopathic membranous nephropathy, and in those who were positive for anti-THSD7A antibodies, which implies that all patients who were negative for PLA2R antibodies were double screened for both PLA2R and THSD7A antigens in the biopsy sample. Biopsy studies could not be performed in patients with secondary membranous nephropathy. A flow chart of the patients is shown in Figure 1. The percentages of patients with PLA2R-associated and THSD7A-associated idiopathic membranous nephropathy are shown in Supplemental Figure 1. Among the 578 patients with idiopathic membranous nephropathy, 514 (89%) patients were PLA2R-associated, including 394 (68%) patients with circulating anti-PLA2R antibodies and 120 (21%) patients negative for anti-PLA2R antibodies but showing enhanced granular expression of PLA2R in glomeruli. Sixty-four (11%) patients had neither detectable anti-PLA2R antibodies nor PLA2R antigen in immune deposits. Twelve patients (2%) had THSD7A-associated membranous nephropathy, which accounted for 16% (ten of 64) of the PLA2R-negative patients (Figure 2, Supplemental Figure 3). They all presented with enhanced expression of THSD7A in glomeruli. Among them, circulating anti-THSD7A antibodies were detected alone (without anti-PLA2R antibodies) in six patients. Two patients were found with dual positivity for both anti-THSD7A and anti-PLA2R antibodies and enhanced staining of the two antigens in immune deposits. Figure 2 shows illustrative examples of serologic and biopsy studies. Fifty-four (9%) patients were negative for both PLA2R and THSD7A, detected either by serology or immunohistochemistry. Among them, 87 sequential samples from 26 patients were collected during follow-up of 27±12 months. Both anti-PLA2R and anti-THSD7A antibodies remained negative. Circulating antibodies against PLA2R and THSD7A and glomerular expression of the antigens in two illustrative patients with idiopathic membranous nephropathy. Column one presents the detection of circulating anti-THSD7A antibodies by immunofluorescence (×200). Column two presents the glomerular expression of THSD7A by immunohistochemistry (×400). Column three presents the detection of circulating anti-PLA2R antibodies by immunofluorescence (×200). Column four presents the glomerular expression of PLA2R by immunohistochemistry (×400). Patient 1 had both anti-THSD7A and anti-PLA2R antibodies and enhanced expression of the two antigens in glomeruli. Patient 2 showed reactivity against anti-THSD7A antibodies alone and enhanced expression of THSD7A in glomeruli. Abs, antibodies. Among the 114 patients with secondary membranous nephropathy, 29 (25%) patients had circulating anti-PLA2R antibodies. Eleven (11 of 49, 22%) of them had hepatitis-B virus replication and glomerular deposits of hepatitis-B virus antigens. Eighteen (18 of 44, 41%) had cancers. IgG1 was predominant among the four IgG subclasses against PLA2R in the patients with hepatitis-B virus and IgG3 was predominant in the patients with cancers. However, IgG4 was the predominant IgG subclass against PLA2R in the patients with idiopathic membranous nephropathy, although the differences did not reach statistical significance (Supplemental Table 1). Anti-THSD7A antibodies were detected in only one (one of 44 patients with cancer, 2%; one of 114 patients with secondary membranous nephropathy, 0.9%) patient with urinary bladder cancer, which occurred 7 years before the diagnosis of membranous nephropathy (Supplemental Table 2, No. 28). Endoscopic resection was performed, and the patient was given chemotherapy afterward and achieved remission. No cancer relapse was observed before or after the occurrence of membranous nephropathy during follow-up. No anti-PLA2R or anti-THSD7A antibody was detected in other disease controls or healthy individuals. The circulating antibodies from plasma of the two patients with double positivity of anti-THSD7A and anti-PLA2R antibodies were further characterized by western blot analysis, which showed reactivity with 180-kD and 230-kD bands representing PLA2R and THSD7A, respectively (Figure 3). Crossreaction between these antibodies was investigated using inhibition ELISA and immunofluorescence assay (Supplemental Figures 2 and 3). 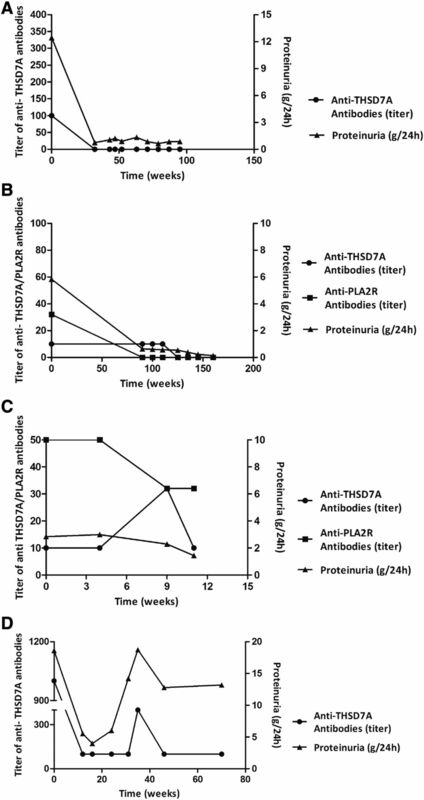 The binding of anti-PLA2R antibodies to solid-phase immobilized PLA2R was inhibited by preincubation with PLA2R but not by preincubation with THSD7A. The binding of anti-THSD7A antibodies to the slide-adsorbed HEK293 cells transfected with THSD7A isoform could be inhibited by preincubation with THSD7A but not by preincubation with PLA2R. Thus, no crossreaction was detected with those tests between the antibodies against PLA2R and THSD7A. 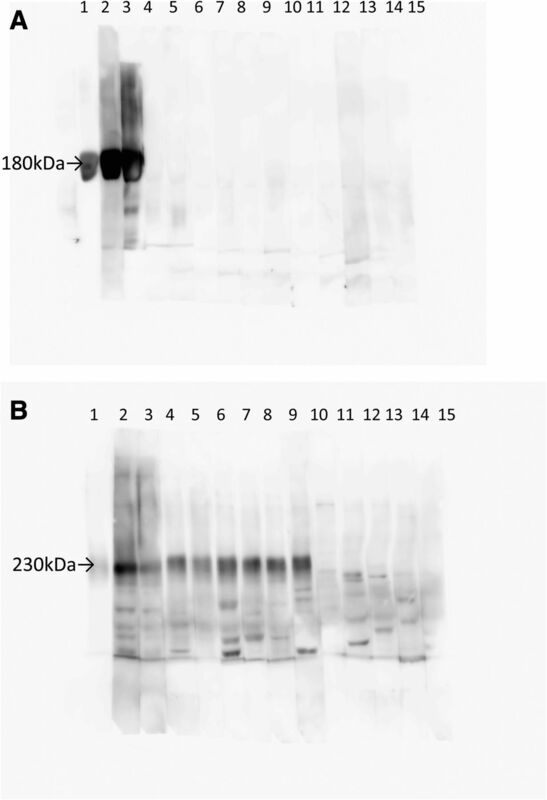 Confirmation of circulating anti-PLA2R (A) and anti-THSD7A (B) antibodies by western blot analysis. Recombinant PLA2R (A) and THSD7A (B) were electrophoresed and submitted to western blot analysis. Lane 1: positive control (mouse anti-PLA2R antibodies [A] and rabbit anti-THSD7A antibodies [B]); lanes 2–3: the two patients with dual antibody positivity against PLA2R and THSD7A; lanes 4–9: the six patients with positive anti-THSD7A antibodies and enhanced antigen staining in glomeruli; lanes 10–13: the four patients with enhanced staining of THSD7A antigens but without circulating antibody detected by immunofluorescence assay; lane14: negative control (healthy blood donor); lane 15: blank control. These two patients with double positivity also showed enhanced granular expression of both THSD7A and PLA2R along the outer aspect of the glomerular basement membrane. Colocalization of THSD7A and PLA2R in glomeruli was investigated using immunofluorescence confocal microscopy (Figure 4). The merged image confirmed the colocalization of THSD7A and PLA2R antigens in the immune deposits, which suggests that both antigens participated in the formation of immune complex. Colocalization of THSD7A and PLA2R staining in glomeruli in the two patients with dual positivity for anti-THSD7A and anti-PLA2R antibodies. The expression of THSD7A is shown in green and that of PLA2R in red. Coexpression of the two antigens is shown by the merge of the fluorescence in yellow (×600, ×1000). +, positive; -, negative. The clinical data of the 12 patients with THSD7A-associated idiopathic membranous nephropathy are shown in Table 1. Eight patients were male and four patients were female, with a mean age of 52±18 years. All of the patients presented with heavy proteinuria (median, 5 [interquartile range, 4–12] g/24 h) and nephrotic syndrome. The mean serum albumin level was 25±6 g/L and the mean serum creatinine level was 0.9 (0.6–1.1) mg/dl at the time of kidney biopsy. Six (50%) patients received corticosteroids combined with immunosuppressive agents. During the follow-up of 27 (19–34) months, 11 (92%) patients achieved complete or partial remission, whereas three (27%) patients underwent relapse. One (8%) patient developed kidney dysfunction. Among the 578 patients with idiopathic membranous nephropathy, seven patients were lost to follow-up (Figure 1). The clinical and pathologic features of the 510 patients with PLA2R-associated membranous nephropathy and 49 double-negative patients were compared with those of the 12 patients with THSD7A-associated membranous nephropathy. Patients with THSD7A presented with comparable clinical features, pathologic lesions, treatment responses, and kidney outcomes, compared with the patients with PLA2R and those without specified autoimmune disorder (Table 2). Among the eight patients with anti-THSD7A antibodies in circulation, four patients had sequential samples available during follow-up. Patient 1 (Figure 5A, Table 1, No. 3), who showed reactivity against THSD7A alone, received immunosuppressive treatment, and achieved partial remission in parallel with antibody clearance. Patient 2 (Figure 5B, Table 1, No. 1), who showed double positivity for both anti-THSD7A and anti-PLA2R antibodies, received only angiotensin converting enzyme inhibitors and achieved spontaneous, complete remission in parallel with antibody clearance. Patient 3 (Figure 5C, Table 1, No. 2), who was also double-positive for both antibodies, received angiotensin converting enzyme inhibitors and did not achieve remission. However, because of recent referral, the follow-up time of patient 3 was short (3 months). He had low and fluctuating antibody titers. Interestingly, anti-PLA2R antibodies started to decrease when anti-THSD7A antibodies increased. Patient 4 (Figure 5D, Table 1, No. 7) showed reactivity against THSD7A alone, received immunosuppressive treatments, achieved partial remission in parallel with antibody decreasing, but experienced a relapse in parallel with antibody increasing. Sequential detection of anti-THSD7A antibodies and assessment of urinary protein excretion in four patients during follow-up. Antibodies against THSD7A were assessed in sequential samples for each patient. Note parallel evolution of antibody titers with proteinuria in the two patients who achieved clinical remission (A and B), low and fluctuating antibody titer in the third patient (C), and fluctuating high titer in the fourth patient (D) with relapse after partial remission. In this study, we screened a large cohort of 578 consecutive Chinese patients with idiopathic membranous nephropathy for anti-THSD7A and anti-PLA2R antibodies and the presence of antigens in kidney biopsy samples from all patients with negative serology. We made five important observations. (1) In idiopathic membranous nephropathy, the prevalence of THSD7A-associated cases is low, being 2% of all patients and 16% of those negative for PLA2R. (2) Sensitivity of antigen detection in immune deposits is higher than that of circulating antibody measurement. The high prevalence (89%) of PLA2R results from the combined screening for both circulating antibodies and the presence of antigen in kidney biopsy samples. However, the sole detection of antibodies would have led to a lower prevalence of 68%, as observed in many studies (2,4–7). (3) Anti-PLA2R antibodies are not uncommon in hepatitis-B– (22%) and cancer- (41%) associated membranous nephropathy. However, the overall prevalence of anti-PLA2R antibodies is still much higher in idiopathic membranous nephropathy (68% versus 25%). (4) The demography, clinical presentation, and outcome are comparable between THSD7A- and PLA2R-associated idiopathic membranous nephropathy patients. (5) We also report for the first time that two Asian patients with membranous nephropathy were dual-positive for noncrossreactive PLA2R and THSD7A antibodies. The prevalence of THSD7A-associated idiopathic membranous nephropathy in the present Chinese cohort seems to be slightly lower than that in a recent study comprising 1276 patients of three different cohorts from Germany and Boston using the same immunofluorescence test (8). Iwakura et al. (14) showed enhanced granular expression of THSD7A in 9.1% of 92 Japanese patients (9). Larsen et al. (15) demonstrated the positive staining of THSD7A in 3.5% of 258 consecutive patients with nonlupus membranous nephropathy in another North American cohort (11). We suggest two explanations for the lower prevalence of THSD7A in the Chinese cohort. (1) The immunofluorescence test is a little bit less sensitive (92%) than western blot analysis that probably better preserves conformational structure of the antigen (4,8), although this can be compensated by combined antigen analysis. (2) In the studies of PLA2R-associated membranous nephropathy, there have been discrepant results on the risk HLA alleles drawn from different populations (15). The genetic background may contribute to different autoimmune response to THSD7A as well. The clinical and pathologic characteristics, treatment responses, and kidney outcomes of patients with idiopathic membranous nephropathy with anti-THSD7A antibodies were comparable to those with anti-PLA2R antibodies. We did not find the female preponderance reported by Hoxha and colleagues (8). Because the association of THSD7A to malignant diseases was previously emphasized (8), we performed intensive cancer screening in the patients with THSD7A in our cohort, but failed to detect the occurrence of cancer during an average follow-up period of 23±13 months. Only one patient with cancer was found positive for anti-THSD7A antibodies, which seemed unlikely to be connected with the tumor. Our results are at variance with those of Hoxha et al. (12) showing that eight of 40 patients with THSD7A-associated membranous nephropathy developed a malignancy within a median time of 3 months from diagnosis of membranous nephropathy. THSD7A antigen was reported to be located in tumor cells, metastatic cells, and dendritic cells of the metastatic lymph node in two patients (16–20). Further studies are needed to elucidate these discrepancies; however, intensive screening for malignancy seems warranted, especially in the first year during follow-up. The presence of circulating anti-PLA2R antibodies was not uncommon in patients with hepatitis-B– (22%) and cancer- (41%) associated membranous nephropathy. IgG subclass distribution of the circulating antibodies was different from that of patients with idiopathic membranous nephropathy. The high prevalence of anti-PLA2R antibodies in hepatitis-B–associated membranous nephropathy has been reported in two previous small series from China (21) and Europe (22), suggesting that immune perturbations induced by the viral infection may trigger anti-PLA2R response possibly via antigen mimicry or epitope spreading (23). Another surprising finding is the high prevalence of antibodies against PLA2R in cancer-associated membranous nephropathy. The time interval between cancer and the diagnosis of membranous nephropathy was <6 months in ten of 18 patients, indicating a plausible causality link. However, we cannot exclude a coincidental association of the two diseases, and the detection of membranous nephropathy antigens in tumor tissue should be performed in further studies. In this study, we reported two (0.3%) patients with idiopathic membranous nephropathy with double-positive antibodies against PLA2R and THSD7A. Such cases were firstly reported in 2016 in a North American cohort (11). No crossreaction between the two kinds of antibodies was demonstrated in this study, which implies a dual activation of B cells. The staining of PLA2R and THSD7A merged in a granular pattern along the glomerular capillary wall, which suggests that autoimmune response directed against both antigens participated in the immune-complex formation and deposition. These findings indicate that autoimmunity against PLA2R and THSD7A can occur in the same patient through different ethnic groups. Our study has several limitations. (1) We could not perform the detection of THSD7A and PLA2R antigens in all kidney biopsy samples from 578 patients. The patients were screened at first for the circulating antibodies. Then the expression of antigens in glomeruli was examined in seronegative patients. However, this study showed an accurate prevalence of THSD7A-associated and PLA2R-associated membranous nephropathy, except for the rare, hypothetic cases with anti-PLA2R antibodies and glomerular THSD7A antigen. (2) We lacked kidney biopsy specimens for antigen detection in patients with secondary membranous nephropathy; this might have led to an underestimation of THSD7A- and PLA2R-associated cases. The outcome information for these patients was also incomplete, which impeded comparison of outcomes between patients with idiopathic and secondary membranous nephropathy. (3) In this retrospective study, the kidney biopsy samples could not be used for IgG subclass analysis in the absence of frozen specimens. In summary, THSD7A-associated idiopathic membranous nephropathy has a low prevalence in Chinese patients, a similar clinical presentation with PLA2R-associated one, and a questionable relationship with cancer. Two patients with noncrossreactive PLA2R and THSD7A antibodies were identified, suggesting the occurrence of dual autoimmune response and the importance of using an antigenic panel when subtyping idiopathic membranous nephropathy. The technical support by Lu Bai is greatly appreciated. This work is supported by grants of the Natural Science Foundation of China to the Innovation Research Group (81621092), the Outstanding Young Scholar (81622009), and other programs (81330020, 81370801), and the Capital of Clinical Characteristics and Applied Research Fund (Z161100000516039). P.R. is a recipient of grants from the European Research Council ERC-2012-ADG_20120314 (Grant Agreement 322947) and the 7th Framework Programme of the European Community Contract 2012-305608 (European Consortium for High-Throughput Research in Rare Kidney Diseases). This article contains supplemental material online at http://cjasn.asnjournals.org/lookup/suppl/doi:10.2215/CJN.01460217/-/DCSupplemental.